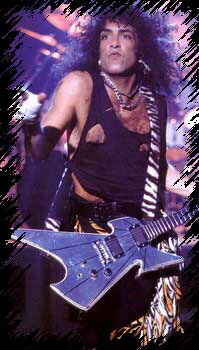 This is a tribute to the one of a kind custom guitar that Hamer made for Paul Stanley back in the day !!! Paul played a lot of Hamer's but he never made an endorsement deal with Hamer. 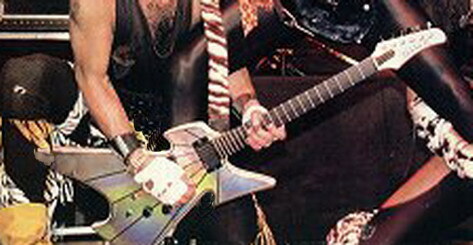 The reason Paul never cut a deal with Hamer is probably because Hamer was a real custom shop back then. When you are building real custom guitars it is much harder to produce mass quantities of instruments. Ibanez being an Asian company could easily mass produce in the quantities required to be able to turn the dollars that Paul was charging for an endorsement. Hamer must have built 15 guitars at least for Paul but there was never an endorsement deal cut to my knowledge. All Abstracts are available with almost any custom mod you can think of. You can choose the wood you want, We carry 44 different types of wood on the premises. You can choose whatever pickups you like, We carry all the major brand names and many boutique brands like Tom Holmes. You can order most models with any headstock on our list or design something yourself. You can choose the hardware and you can design the electronics. Most models are available in Basses, Doublenecks, Neck Through Body, Bolt On, Headless like a Steinberger, Baritones, Left Handed or whatever your heart desires.